We are a little less than four months away from the big day and we just changed EVERYTHING!!! All of you other bride-to-be’s are probably freaking out for me when you read that first sentence. Well, don’t fret. I am beyond relieved. We started off wanting a small wedding which then turned into a medium sized wedding (70ish people) and that may not sound crazy, but it just became overwhelming. We started losing the things that we valued and wanted most on our big day. We had to compromise on things because of the cost then multiplied by 70 people and it became too much to handle. Now, we are having a small wedding (just family) in my grandparent’s backyard. This is a big change from what we were having for. But, I could not be happier. We get to be surrounded by the people who love us most and we get to just relax and enjoy the day. 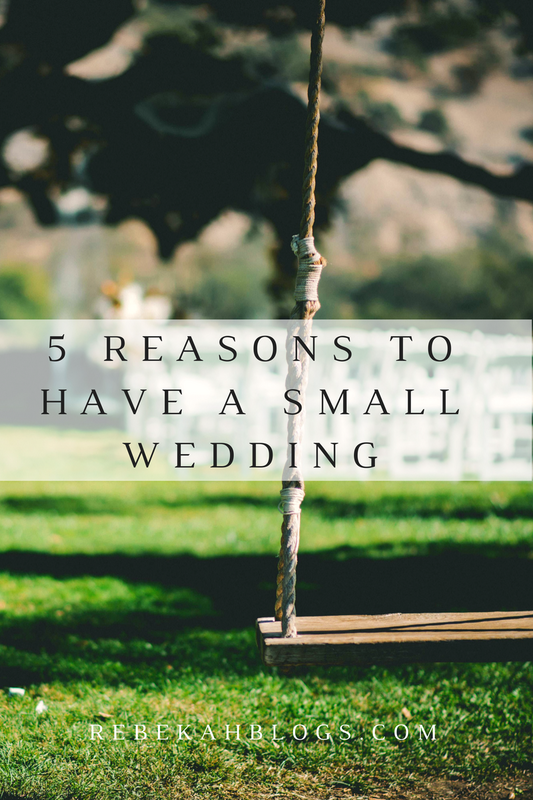 Below are the reasons and perks to downsizing a wedding. Disclaimer: I am not saying big weddings are bad, I am just giving some perks to a small wedding. Intimacy. You will get to truly enjoy your guest because theirs not that many of them! You get to have that one-on-one time and you won’t feel like you didn’t see half your guest. Cost! Things will cost less with fewer people to pay for. You might also get to splurge on some things because you don’t have to pay for such a large quantity of people to enjoy it. We get to enjoy our fav food on our wedding night, FAJITAS, now that we don’t have to feed so many mouths! Creativity. With a small wedding, you get to truly enjoy DIY projects. Making 15 fun DIY items is a lot easier than stressing out about making 70 items or just giving up on the DIY aspect you may love. I really wanted to make certain things that would have been just too hard with such a large guest list. Now I get to make everything I want and stuff I didn’t know I wanted! Save feelings. One thing we can to cross with was over-inviting. We didn’t want to hurt somebody’s feelings for leaving them out of the wedding but also didn’t really care if they came or not. Now, we will have all of our family and our two best friends there to enjoy the moment with us without worrying about hurt feelings. It wasn’t anything personal we just wanted a small wedding. Options. Having a smaller wedding gave us a lot more freedom to truly have the wedding anywhere we wanted. We chose my grandparent’s backyard, it is one of my favorite places with so many amazing memories and it just made sense. Their home always felt like a second home to me and I am so excited I get to start my forever their. There are so many neat places you could find that will fit a smaller amount of guest, or even have a destination wedding. Best reason to have a small my wedding at my grandparents- I get to have my dog at my wedding now!!!!! !